Tusk is a high end, full service interior design firm specializing in all aspects of the residential and commercial design process. Sarah is known for her modern, fresh approach while maintaining simplicity and a crisp aesthetic. Tusk’s portfolio includes designs for every room, from sophisticated living rooms to custom kitchens, bathrooms and cheerful playrooms. Her attention to detail and extraordinary project management skills makes her an invaluable partner on any project. She brings to life a special experience with each space she touches. From initial concept through design development, she fine-tunes the reality of the design with collaborations with her clients. Cheryl Willhite ASID, an allied member with degrees in Fine Arts and Interior Design, brings more than 30 years of experience in high-end design to her clientele. Her talents and vast experience have built an impressive portfolio that encompasses projects ranging from private homes and vacation hideaways, to the restoration of Bed & Breakfast Inns and Country Clubs, to multinational corporate offices and pleasure yachts. Cheryl’s true gift is her innate ability to capture your vision and deliver a space that looks both personal and collected over time, but never staged… a warm and inviting space that will continually delight and comfort your soul. We create sophisticated, functional spaces reflecting the philosophy that one’s home should be an oasis in which to live, relax and entertain, all the while incorporating the personality of the owner. Finding what's important to you in a space and creating a room that embodies beauty, comfort, and function. Whatever your personal taste may be, I will help you attain the space you will love. Check out my Pinterest decor boards at margaretbondy2. Margaret Bondy Interiors In Wilton Connecticut collaborates with clients to achieve their aesthetic vision and practical needs while staying within their budget. Step one is reviewing the client's items that should remain and formulating a floor plan. Then a presentation, usually at our showroom at 652 Glenbrook Rd., Stamford, includes furniture placement, window treatments and wall color. CeCe Barfield, Inc. is a full service interior design firm, founded in 2015. Before founding her firm, CeCe spent time working at Vogue and refining her talents with the legendary Bunny Williams. Award wining designer Connie Cooper of Connie Cooper Designs offers full-service interior design .They specialize in residential design. Its goal is to create a home environment that is tailored to the individual client's personal style, needs, and budget. Connie Cooper does not impose a signature design style.. Instead she listens to her clients and guides them in expressing their own personal style to create a look that can be enjoyed for years to come. Connie studied Interior Design at Michigan State University and earned a Bachelor of Fine Arts in Textile Design at Rhode Island School of Design. Her unusual combinations of color, texture and pattern are based on knowledge from her earlier career designing textiles, floor coverings and wallpaper. She lived in Asia for seven years with her family, traveling and collecting Asian arts and antiques. This experience helped to nurture her eclectic approach. With a depth of experience in the arts and the home furnishings industry, she knows how to create unique spaces that are fresh and interesting but will stand the test of time. Connie's artistic flair and willingness to go the extra mile ensures that you will find a creative solution for any design issue. Whether it is one room or a whole house ,Connie Cooper Designs will create a home that looks fresh and new and will be uniquely yours. Connie Cooper Designs won The Hobi Award for "Best Interior Design 2016" and was also a finalist for Moffly Media's A-LIST award in the Living Spaces category. Contact Connie Cooper for your next design project! Working with A-List Interiors takes the stress out of design projects and makes them fun. Together, Anelle and Ariella bring their complementary skill sets to interior projects both large and small. Lynn B. Garelick, ASID, has created a diverse collection of interiors that reflect her clients’ personalities and tastes. These interiors span a broad array of periods, localities and environments. Professional designer, artist and display. Decorative Arts offers full service interior design. Karen's team of professionals will ensure your project is an enjoyable experience bringing beautiful, functional results. Our goal is always to respond to our clients’ ideas, standards and personalities in order to deliver homes that are as personally functional as they are individually beautiful. At Diana Sawicki Interior Design we create fresh & inviting home interiors. We have a deep commitment to quality & welcoming havens that people want to come home to at the end of a busy day. Ken Gemes has a less is more approach to design. Cognizant of the daily demands of the modern family, Gemes design aesthetic focuses on creating environments that are at once elegant and inviting. Tamara K Designs provides experienced and customized interior design and consulting for individuals and builders. Through listening, great design, teamwork, reliable resources, attention to detail and LOTS of imagination, Denise Wenacur and team create customized solutions tailored to clients' individual tastes. Lynne Scalo has more than a decade of Interior design experience. Her sophisticated yet functional design aesthetic reflects her ability to seamlessly blend modern glamour with classic elegance. Fairfield County Full-Service Interior Design Firm | Best of Houzz! Janet has designed projects with clients from London to Westport, Greenwich, New Canaan and Boston and Manhattan. 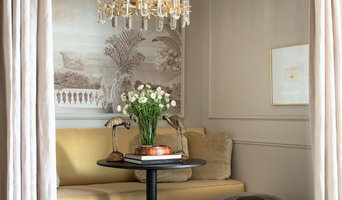 Her client’s lifestyle is foremost in her creation of beautiful spaces. Our goal is to provide unsurpassed client service and interior design excellence. We believe in creating sophisticated and intimate environments supporting each of our clients to realize their vision. Francine Murnane Interior Design, based in Wilton, Connecticut, was founded in 1996 by Francine Murnane, a noted designer with a 20-year career. Francine is a graduate of the University of Bridgeport’s Shintaro Akatsu School of Design, where she studied interior design and architecture. A gifted artist, she refined her craft early in her career with such notable firms as David Easton Interiors in New York and Beverly Ellsley Design in Westport, Connecticut. She developed extraordinary range, a keen eye for detail, and remarkable ability to reflect her clients’ personalities onto their surroundings. This intuitive ability also forms the basis of her personal commitment to clients. Francine has piloted projects for a variety of private clients at home and abroad, earning a reputation for beautiful, client-centric interiors in a range of transitional, classic and modern styles. Her diverse portfolio includes a sprawling multi-family residence and villas in Saudi Arabia, a penthouse in Cairo, luxury apartments in Dubai and a waterfront residence in the British Virgin Islands. In the U.S., she has designed interiors in Beverly Hills and Montecito, California, and locally, in lower Fairfield County and West Hartford, Connecticut, as well as Westchester County and Manhattan, New York. Inspired by her experiences transforming bedrooms into luxurious havens, Francine created a unique line of custom luxury linens called Francine Home Collection. Marsha has 20+ years of experience in high-end residential & commercial design. Her scope ranges from fabulous designs for a room or two, to building a high end dream house from the ground up. Gail Green Interiors is a high-end luxury interior design, architecture, and decorating firm specializing in upscale residential and commercial projects throughout the country. Attention to detail, timeless elegance, classical simplicity, and quality workmanship are our hallmarks. Our style retains the best elements of modernism set within the idioms of the past. Synthesis is the key to our success, marrying the elegance of the past with the clarity of the present. We benefit the client through creating the perfect synthesis of design and architecture. Spaces flow into rooms that are light, bright, and airy, making for a beautiful, comfortable, and functional home. Meticulous attention to detail and a commitment to service are the designer’s hallmarks and why many clients return time and again. The work of a professional can make all the difference. Whether your home has 10 bedrooms, or your apartment is 800 square feet, it can be tricky to create a cohesive look that is representative of your style. That's where a local Southport interior designer comes in. A home decorator will help distill your tastes and ideas into a design that suits the needs of your space. Whether you need help creating a functional space plan, rearranging existing pieces, designing the inside of a new home, or simply sourcing amazing furniture and decor, seeking the help of professional interior designers and decorators in Southport, CT is a must. A good home design professional will hone your style down to its very essence and be able to choose a functional layout that feels natural to you. Interior design companies can be involved as much or as little as the client desires. Many clients who hire an interior decorator in Southport, CT — particularly those who are remodeling — have a good sense of how the room should look and what products they should use. Often clients will insist that interior decorators use the products already present in the house. Other times a designer will need to start from scratch — especially if this is a newly purchased or just-built home. An interior design company will need to figure out exactly what the client needs, which includes organizing rooms, picking flooring and wall colors, and finding furniture to complement it all. Sometimes that means he or she will have to recruit help from other Southport, CT home professionals to help create the perfect look for your renovation. Here are some related professionals and vendors to complement the work of interior decorators: . Do your research before meeting with an interior designer or home decorator in Southport, CT. Ask yourself what you want your space to become and what it will be used for. Figure out the extent of what you need help with, what your must-haves are and what your budget is. Interior design services can add up fast, so be up front with a potential design firm or individual from the beginning. Also, pick an interior decorator that fits your style. Browse through the portfolios of different Southport interior design firms and decide if you would live in those houses. Just because you like something doesn’t mean you could live in it. There's a big difference! Find an interior designer or home decorator in Southport, CT on Houzz. Narrow your search in the Professionals section to find Southport interior designers near you. 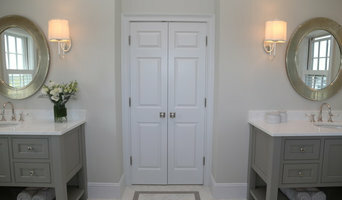 You can also look through Southport, CT photos to find a room you like, then contact the design firm who designed it.